Sustainia helped to transform the University’s approach to sustainability reporting by uniting two previously separate pillars of their sustainability strategy. The University of Copenhagen has a strong focus on sustainability, both in how their buildings and researchers perform environmentally, as well as their programmes and research focus. It can be challenging to tie all of this together and communicate it engagingly to current and prospective students, who are becoming ever more demanding of universities on these fronts. For a university aiming to be a leader in sustainability, this was something that needed addressing. 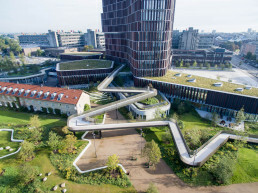 The University of Copenhagen has for some years published a sustainability report, showing changes in energy and water usage, recycling and more throughout their campus buildings. However in 2018, we helped guide the University of Copenhagen to incorporate a more holistic overview of sustainability for their report. For the first time, the sustainability report took into account not only the environmental impact of the university’s buildings, but also the sustainability initiatives in the teaching and research. By adding in an engaging narrative, and showing the faces behind the research, we made the report more engaging and understandable. Our designers also created visualisation that brought important data in the report to life (such as CO2 emissions), and these graphics were ready-made to be shared across social media, together with advice for concisely communicating their impact on the various platforms. The report is available for download and was also dispersed during the University’s sustainability fair in 2018. The University of Copenhagen is a research led university and is the oldest university in Denmark, having been founded in 1479. They work closely with the Sustainability Science Centre, who play an important role in the sustainability strategy and education outreach. They are also part of the International Alliance of Research Universities (IARU) - a network of like-minded universities aiming to make drastic improvements to the environmental performance of universities.